The easiest and fastest way to travel to Botswana is a connecting flight from Johannesburg International Airport (O.R Tambo) in South Africa, although there are also connecting flights from Cape Town and Windhoek (Namibia) available. Currently there are no international carriers that fly directly to Maun Airport. Transport in Botswana is relatively efficient. Getting to your lodge or destination is as easy as jumping on an air shuttle service or a safari vehicle, this is where the choice is really up to you based on your requirements, time and budget. Fly or be driven, with each one of these options comes a cost, private air charters being the most expensive while the most viable option would be a guided road transfer. It is also worth noting that some of the more remote camps and lodges are only accessible via aircraft or boat. The best way to get to Botswana is to fly to Maun or Kasane. These two towns have international airports and are located in northern Botswana, close to popular national parks and main roads, and these airports facilitate the arrivals and departures of domestic flights to airstrips in the Okavango Delta, Moremi Game Reserve, and Central Kalahari. Self-driving travellers can easily access Botswana through the border posts from neighbouring countries, so it can be incorporated into a road trip holiday, but time allowances must be made for the length of time spent on the road. Maun International Airport is the main hub for all flights entering Botswana as a safari destination; the airport is located within the town itself. 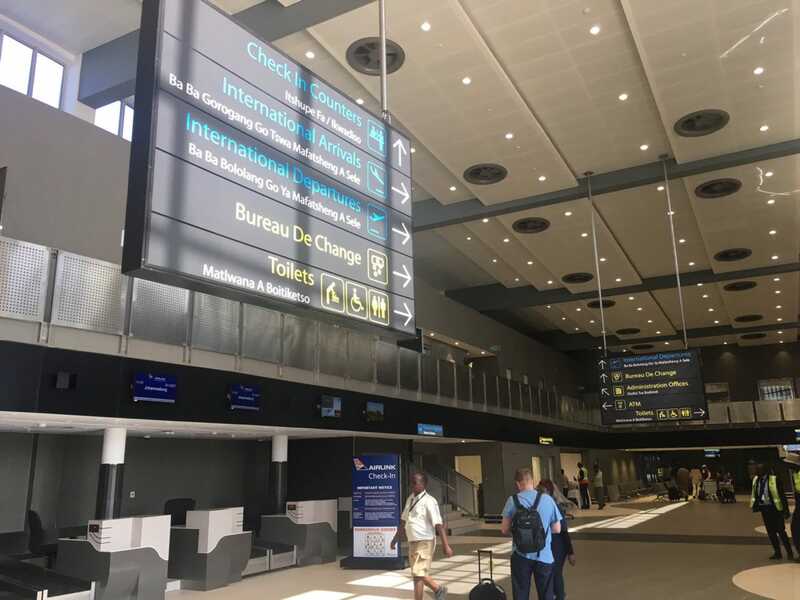 Sir Seretse Khama International Airport is located just 10 kilometres north of Gaborone, offering daily one hour flights from Johannesburg and three weekly two hour flights from Harare. Kasane International Airport is located around four kilometres south of the town of Kasane and lies just a few kilometres away from the Chobe National Park.